Education - A Dream fulfilled? Standard Education(K-12): During the late 1940’s, African Americans age 65 and older had poor literacy rates. Most could not even read or write their own names. By the 1960’s, the literacy rate for the younger generations of African Americans had nearly been eradicated or destroyed. Because the majority of the literacy rate vanished for African Americans, they now today rank below that of White or Asian students but ranked higher than that of Hispanic Americans.Many policy makers are now proposing that this massive gap will be eliminated by affirmative action, desegregation, and multiculturalism so that all African American students will score no less than that of White or Asian students.Although African American students seem to score lower than the average White or Asian Americans, their education has been greatly expanded since the Civil Right's Movement. 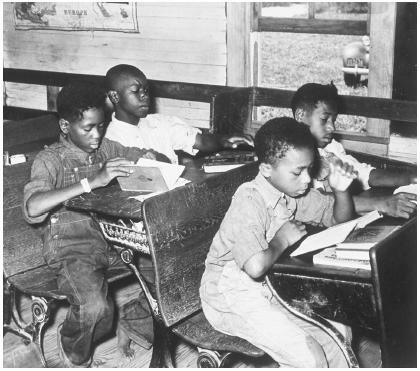 African American Elementary students attending school during the 1960's. 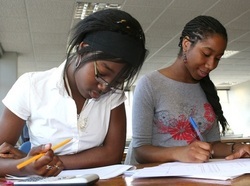 Higher Education/College: Just over 1 million African Americans were attending college in the 2000 Census. This a very disappointing number of African Americans, for the some 41 million African Americans who already live in the U.S., who are attending college. The standardize test scores for these students seem to lag behind Americans of whom are descendants from Europe and Asia. Two African American girls attending school in present day.